Every practice is at a different stage in adopting cloud accounting. We appreciate that. So regardless of whether you’re looking for ways to grow your practice, spend more time with your family or both, our ProAdvisor Program is designed to support you. 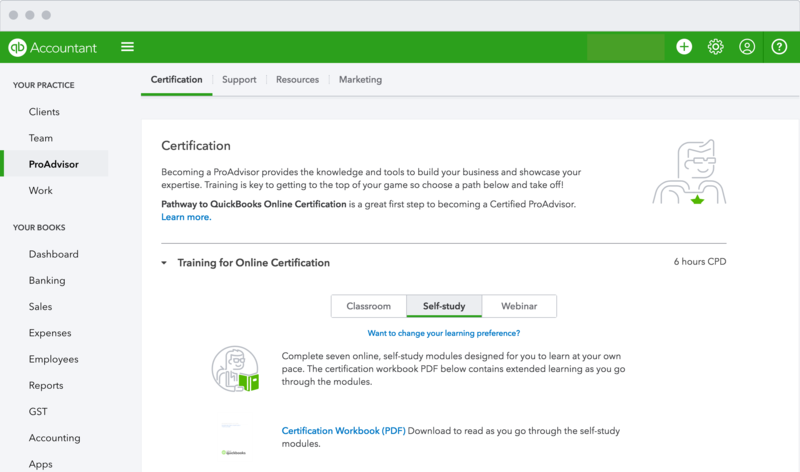 Did you know that you can access free training and certification through the ProAdvisor program? No catch, just free on-demand tools to help you succeed. 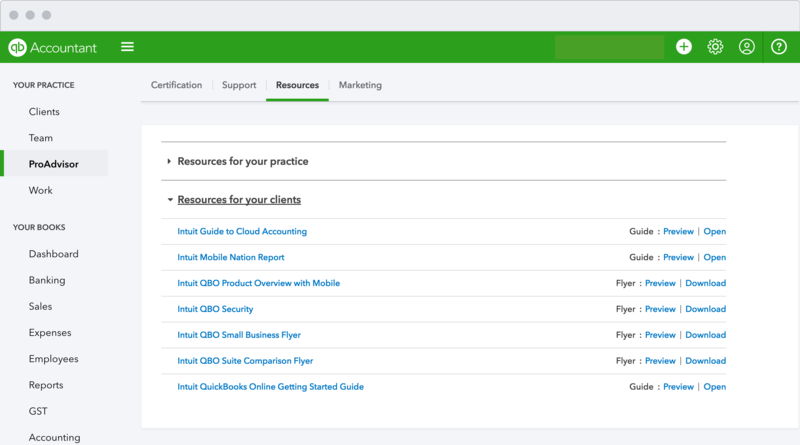 To access your self-paced learning, log in to QuickBooks Online Accountant and select the ProAdvisor tab on the left-hand side of your home dashboard. From here you can launch your self-study modules (image below) and get one step closer to being certified! We want to support you in upgrading your clients to cloud accounting so we’ve created a suite of ProAdvisor benefits to get you on your way. Free data file conversion – the move to accounting software can be daunting, so make the upgrade to QuickBooks Online easy with free data conversion. Fill in the form, upload your client data and we’ll take care of the rest. Free client marketing tools – access marketing tools including brochures, factsheets and ready-made emails to promote QuickBooks Online to your clients. Log in to QuickBooks Online Accountant and navigate to the ProAdvisor tab. Click on Resources and toggle to Resources for Your Clients (image below). Exclusive ProAdvisor discounts – enjoy discounted pricing only available to accountants and bookkeepers. Log in to QuickBooks Online Accountant and on your Clients tab select Add client to access your wholesale discounts. We know growing your practice is the biggest challenge for most accountants and bookkeepers, so the ProAdvisor program has built in tools to boost your business. Start attracting new clients by adding your practice on the Find A ProAdvisor listing and be seen by hundreds of small businesses. To update your profile, log in to QuickBooks Online Accountant and click on the Profile icon in the top right-hand corner. Fill in your business information (as well as a great description that sets your practice apart from the crowd) and don’t forget to select “include in search results” so your profile is displayed. Finally grow your business by coming along to local free Intuit run events designed to deliver education, networking and innovation. Join us at the free Get Connected events around Australia so you can explore the latest trends and pick up tactics that are easy to implement, increase your firm’s productivity and win new clients. Reserve your spot here. Want to know more about your ProAdvisor benefits? Find out more here.